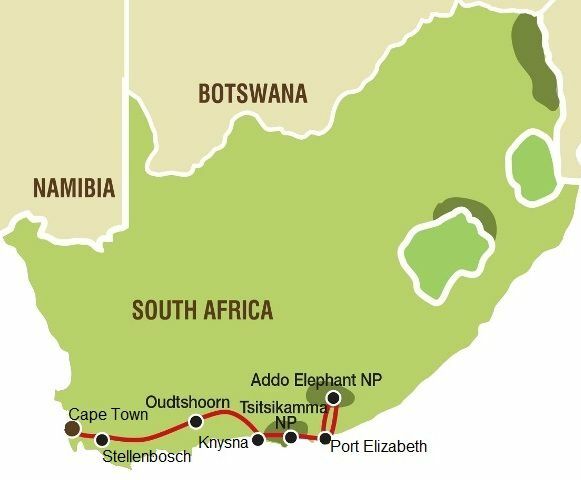 This 7 day Garden Route tour forms part of our 20 day “Explore South Africa (North) ” tour from Cape Town to Johannesburg. During this 7 day tour you will visit some world famous South African highlights such as Cape Town, the wine lands, Oudtshoorn in the Karoo and the Garden Route of course. And no group tour of South Africa will be complete without seeing some wild animals. We go on Safaris in Addo Elephant National Park where you could see the "Big 5". We have a full day ahead of us which takes us from the bustling city centre of Cape Town via the vineyards to the coastal town of Hermanus. En-route we will stop at the largest breeding colony of the African Penguin at Stony Point Nature Reserve. Made up of a collection of villages, farms, rivers, bays, coves and valleys, the Cape Whale Coast is a pristine stretch of the South African coastline which runs from the town of Rooiels for roughly 150km, to the east.During the months of July to November you may be lucky enough to see the southern right whales that visit the bay in Hermanus. Crossing the Hottentots-Holland Mountains this morning we set out for the Klein Karoo and our overnight stop in Oudtshoorn. Oudtshoorn is the ostrich capital of the world. We follow the scenic Route 62 today, stopping to experience one of the many farm stalls on the way. One of the more quirky highlights today is Ronnie’s Shop... a rather interesting country pub! This morning we set out for the Eastern Cape and the Addo National Park. We make a stop this morning in the surfing mecca of Jeffrey’s Bay, famous for its waves. You have the opportunity to visit the small surfing museum, catch a quick wave or simply enjoy a cup of coffee overlooking these famous waves. This afternoon we will make our first visit to seek the elephants after which Addo is named. Addo is also home to the Big 5 and lots of other wild animals. This morning your guide will transfer you to Port Elizabeth where your tour comes to an end.